A woman sustained moderate injuries after her vehicle rolled while being pursued by Santa Barbara County Sheriff's Deputies on Tuesday. 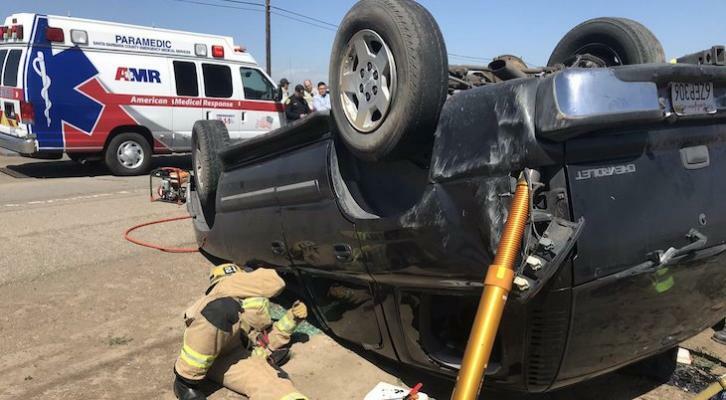 At approximately 2:20 p.m., a Deputy Sheriff assigned to the Sheriff’s Civil Bureau was in the 500 block of West Main Street in the City of Santa Maria when he observed a vehicle being driven in a reckless and erratic manner. The Deputy attempted to pull the driver over who refused and continued to drive recklessly. Deputies backed off and the driver eventually lost control and crashed in the area of W. Main St. and S. Simas Road, reports Santa Barbara County Sheriff's Office. At 2:31 p.m., Santa Barbara County Firefighters responded to the scene, which was between Santa Maria and Guadalupe. Upon arrival, firefighters found a vehicle on its roof with a female driver. It took 10 minutes for firefighters using the Jaws of Life to extricate the woman. The Sheriff's Office determined the driver to be intoxicated. Earlier in the day, the Santa Barbara County Public Safety Dispatch Center had broadcast an alert involving that stolen vehicle provided by the California Highway Patrol. The driver and sole occupant was identified as 26-year-old Keely Gabriella Gonzales of Lompoc. She was transported to Marian Medical hospital with non-life-threatening moderate injuries and then booked into the Santa Barbara Main Jail on charges of Reckless Evading of a Peace Officer, Vehicle Theft, Driving Under the Influence, and Driving on a Suspended License. Gonzales is being held on $75,000.00 bail. Drunk, suspended license, stolen car. Not the brightest bulb in the pack. Poor car owner, "jaws of life" contributing to damage on the vehicle. Hope the owner has good insurance. Her life took a wrong turn, didn't it?